The paper deals with comparison of tensile, flexural and impact characteristics of parts produced by injection moulding technology and Fused Deposition Modeling (FDM). 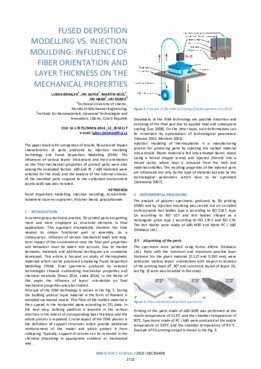 The influences of various layers’ thicknesses and their orientation on the final mechanical properties of printed parts were also among the evaluated factors. ABS and PC / ABS materials were selected for the study and the analysis of the internal stresses of the moulded parts exposed to the surfactant environment (acetic acid) was also included.